Charleville, a rural town in south-central Queensland, is 660 km west of Brisbane and 280 km from the New South Wales border. It is on the Warrego River, at the junction of the Mitchell and Warrego Highways. The Charleville region was explored by Edmund Kennedy in 1847 and by William Landsborough in 1862, the latter's report which motivated early pastoral occupation. The Gowrie run (1863) was positioned on a natural stock route between New South Wales and Queensland, Gowrie Crossing where the route crossed the Warrego. A hotel was constructed there and a town reserve of four sq miles gazetted in 1865. Three years later William Tully, government assistant surveyor, laid out the town's streets. An Irishman, Tully likely named the new town after the town of Charleville, north of Cork, Ireland. During the 1870s Charleville was a rudimentary rural centre with a store, blacksmith, butcher and a police magistrate. In 1876 Cobb and Co made its first run from Charleville to the Roma railhead, carting woolclip. Charleville became an important stopover point for Cobb and Co routes, and in 1886 the company relocated coach building operations from Bathurst into the town, establishing a major factory and creating the first of several industries which made Charleville something of an autonomous bush metropolis. 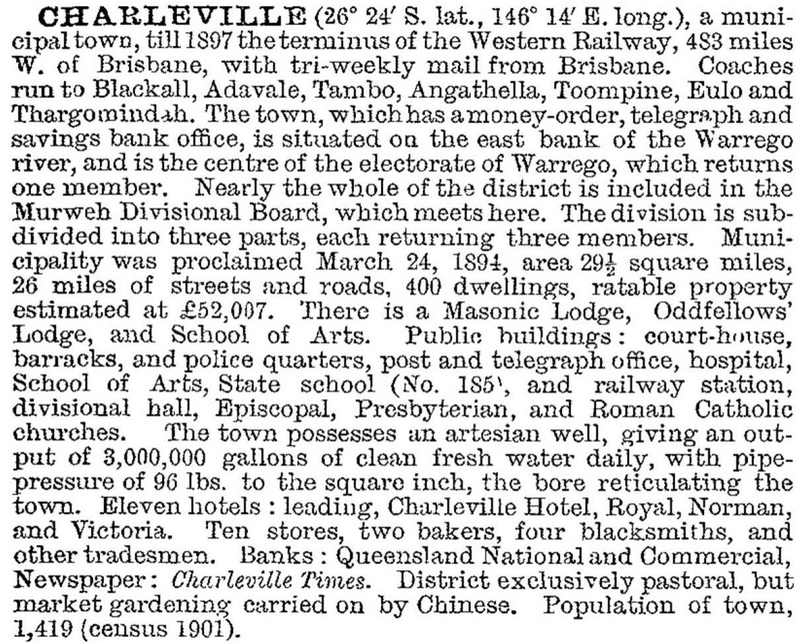 During the decade of the 1880s Charleville took on a fuller shape: aside from the Cobb and Co factory, the Charleville Times began publication (1883), a school was opened (1884), a hospital built (1885) and Anglican and Catholic churches were erected. In 1888 the railway was extended to the town from Morven, making Charleville the terminus. The following year bore water was successfully brought to the surface. The school of arts (1890) augmented a Mutual Improvement Society and the Working Men's Club. By the 1890s town interests felt that the Murweh local-government division was neglecting them, and succeeded in forming the Charleville (town) municipality in 1894. Two years later the town had reticulated water. Unfortunately a short-lived brewer could not tolerate the water quality. Nor did the town's separate municipality status last in the longer term - in 1961 Charleville returned to the Murweh Shire, and was its administrative seat. Charleville also developed as an outback education and health centre, with a boy's hostel (1916) and a girl's hostel (1927) for boarding children from remote areas. A convent school was opened in 1913, and in 1935 a state high school was built. The old hospital was rebuilt as a Base Hospital in 1939. A further medical base was installed in Charleville in 1943 when it was added to the Queensland network of flying doctor bases. The flying-doctor radio network incorporated the School of the Air education service in the 1960s. In common with many towns in central Queensland, Charleville enjoyed postwar prosperity from high wool prices. The reticulated and sewered township had an Olympic swimming pool added (1962), and local thirsts sustained seven hotels. By 2000 the number of pubs had dropped back to four, dependent on tourist spending as well as local patronage. Corones Hotel (1924) has a full-block frontage and has retained many of its internal timber fittings. It is listed on the Queensland heritage register. It sold in 2014 with developer's plans to restore the building in stages. The Corones Hall was used as a large dance hall in the town. The hotel's artefacts were to be housed in a museum. In January 2011, the Railway Hotel also on the Queensland heritage register, was destroyed by fire. Apart from its outback appeal, Charleville has a Skywatch observatory and a Steiger vortex gun, a curious relic from 1902, one of several built and fired in the vain hope of inducing rain during an awful drought. 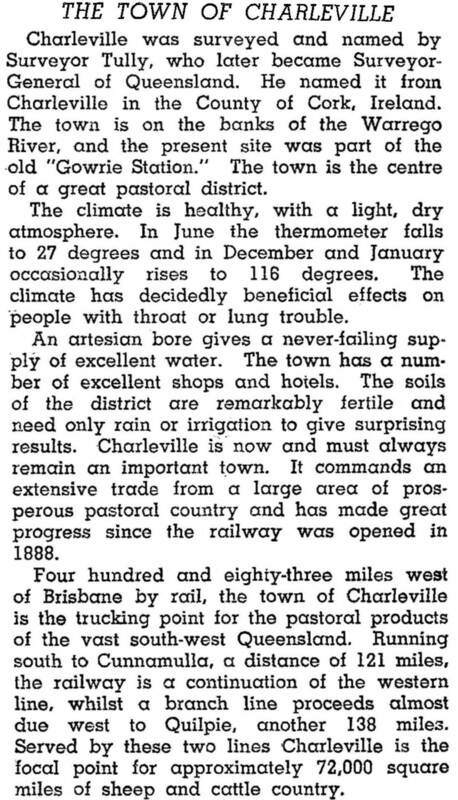 Eighty-eight years later, unassisted by human intervention, record rains flooded over 1000 houses in Charleville. Following widespread flooding in 2012, when it was feared that a levee on the Warrego River would fail, a new diversion of Bradley's Gully was completed in 2013. Charleville has a range of sports facilities, including golf, bowling, horse-racing and the Gowrie oval and speedway. The Charleville and South West Queensland Show Society, the Cultural Association and the Historical House (originally built as a branch of the Queensland National Bank in 1881, now home to the local historical society and listed on the Queensland heritage register) provide alternative recreation. Education facilities comprise a TAFE, State primary (1875) and high (1961) schools, distance education and a Catholic primary school (1913). The airport accommodates ordinary domestic and flying doctor services. A new flying doctor base with visitor centre and hangar (2014) was built at the airport. Retailing, health, education and hospitality have relatively high employment profiles. Major retailers Target and Crazy Clarks closed their Charleville stores in 2014. A new cultural centre was built adjacent to the existing facility (2014-15) with the existing building planned for conversion to an arts centre. Tours of what had been a top secret army base in World War II hosting 3000 US personnel who were testing the Norden Bombsight were recognised by the National Trust with a heritage award in 2013.